Rich and creamy avocados are quite versatile. You can dice them into salads, stuff them with fillings, or mash them to make guacamole or sandwich spreads. Their only big drawback is that they're also high in calories and fat, though the fat is mostly monounsaturated, which isn't as bad as other kinds. Since they bruise easily, grocers want customers to buy them while they're still hard and then take them home to ripen at room temperature for a few days. They’ll ripen more quickly if you put them in a paper bag along with an apple or banana. They're ripe when they yield to a gentle squeeze. To open an avocado, just cut it in half lengthwise around the seed, twist the two halves apart, and then pop the seed out with a spoon or knife. Avocados darken soon after being cut, so serve them right away or sprinkle them with lemon or lime juice to slow the discoloration. Don't ever refrigerate, freeze, or cook avocados. 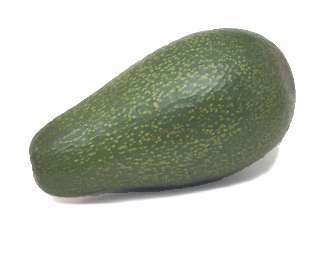 Varieties: The Hass = California avocado is available year-round and has a rich flavor and creamy texture. This is the best variety for guacamole, but it turns a bit mushy in salads. The skin turns almost black when the avocado is ripe—this, unfortunately, can camouflage bad bruises. The Pinkerton peels easily and has excellent flavor. 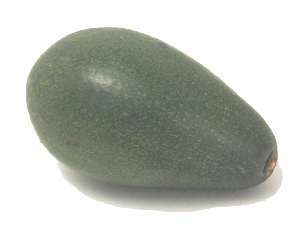 The Reed is a large, round avocado that slips easily from the peel, and has very good flavor and texture. It will stay firm even when ripe, so it's great in salads, but not a good choice if you're making guacamole. The Fuerte = Florida avocado is in season from late fall through spring. It's not quite as buttery as the Hass avocado, but its flavor is excellent. The bacon avocado is a sweet, smooth-skinned variety that shows up in the middle of winter, but isn’t as flavorful as other avocados. 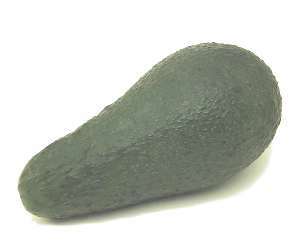 Mexican avocados are small and have shiny black edible skins. avocadito Pronunciation: AV-uh-kah-DEE-toh See cocktail avocado. This sweet, smooth-skinned variety shows up in the middle of winter. It's not as flavorful as other avocados. cocktail avocado = avocadito Notes: This is a very small variety. This is in season from late fall through spring. It's not quite as buttery as the Hass avocado, but its flavor is excellent. This is available year-round and has a rich flavor and creamy texture. 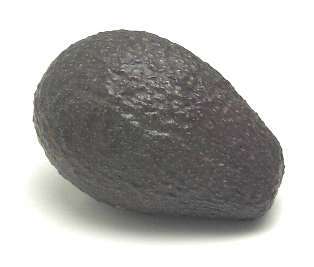 The skin turns almost black when the avocado is ripe, which can camouflage bad bruises. This is the best variety by far for guacamole, but it turns a bit mushy in salads. 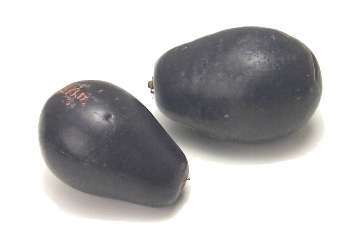 With their small size and shiny black skins, these look like elongated plums. You can eat them, skin and all. These peel easily and their flavor is excellent. One of the best varieties. 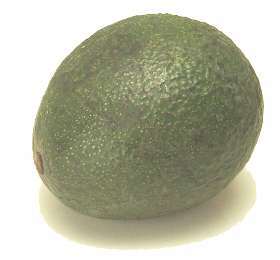 This large, roundish avocado slips easily from the peel, and has excellent flavor and texture. It will stay firm even when ripe, so it's not a good choice if you're making guacamole. The California Avocado Commission is a great source of information about avocados.